Adds a touch of the Mediterranean to your home or garden. 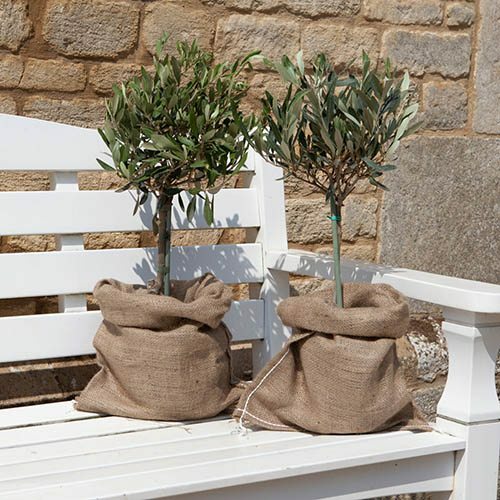 Supplied as a pair of olive trees 60cm tall inc pot, grown in lollipop standard form, in hessian outer sack. The perfect, long-lasting gift for gardeners and foodies alike, these great little olive trees will look fab on patios, balconies and decks across the country. Their lovely evergreen foliage gives year round interest, and adds a touch of the exotic Mediterranean all year. They come in neat hessian sack bags, making them a really nice gift to receive, and the lucky recipient can put them straight outside - they look great in large real terracotta pots for that classic Italianate look. Easy to care for, in a few years in hot summers, they may get a few olives too! All of our Olives are sourced from specialist growers who are regularly inspected and tested for plant pests and diseases, including the new disease threat Xylella. We do not source Olives from High Risk areas. This is followed by further checks and inspections on our own Lincs nursery by DEFRA.